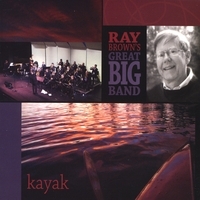 A Jazz Big Band CD of standard and Jazz tunes arranged by composer/arranger/trumpet player, Ray Brown. Ray Brown composer, arranger, trumpet player, has performed as trumpet player and arranged music for Stan Kenton, Bill Watrous, Bill Berry, Frank Capp – Nat Pierce, and the Full Faith and Credit Big Band. Brown also has performed with Mundell Lowe, Leroy Vinnegar, Ray Brown (bass), Thad Jones, Jimmy Heath, Steve Gadd and Billy Hart. Brown conducted the recording session of the Roy Hargrove Quintet entitled “Roy Hargrove with Strings, Moment to Moment,” released May 2000 on Verve. He has appeared at the Monterey Jazz Festival frequently as conductor of his wife Sue Brown's Monterey Jazz Festival Chamber Orchestra in collaboration with Charlie Haden, Kenny Barron, Michael Brecker, Ralph Towner, Gary Burton and Terence Blanchard. Brown currently leads his own big band, the Great Big Band, which is featured on this CD. The band has performed at the Monterey Jazz Festival the San Jose Jazz Festival, the Santa Cruz Jazz Festival, the Lake Tahoe Jazz Festival, as well as jazz venues in the San Francisco Bay area.